Earlier this week, I worked at World Central Kitchen’s new Resource Center. Next door to the café, it provides furloughed workers with fresh groceries (nothing canned! ), infant formula, diapers, feminine products, and pet food. Additionally, companies like Pepco, Washington Gas, and Verizon are there helping people with bills: deferred payments, avoiding late fees, and so forth. I was on the product distribution team. We made thousands of sacks of groceries and handed them out to everyone in the line passing our table en route to diapers and the fruit station. In terms of physicality, it was easier than working in the kitchen. But emotionally, it was a more direct link to everyone hurt by this ludicrous shutdown. And it was hard and humbling and deeply moving. A number of people were teary or in tears. Some seemed or said they were embarrassed. There were parents, kids, babies, owners worried about their pets. There were women in need of Poise pads who were so ashamed to have to carry them out, prompting us to resuscitate all manner of box or bag in hopes of helping them be discreet. I talked to one man who’s been furloughed from USAID, the irony of which was not lost on either of us. Another man shared that his wife, a nonprofit worker, was laid off last year, and now he’s been without pay since before Christmas. They have kids. I shared many hugs. Countless folks thanked me. As if I was doing anything really except trying to thank and honor them. Whole worlds upended, near and longer term futures forcibly adjusted, happily employed people waiting in food lines with heads bowed. IN THIS NATION’S CAPITAL. And throughout the country. 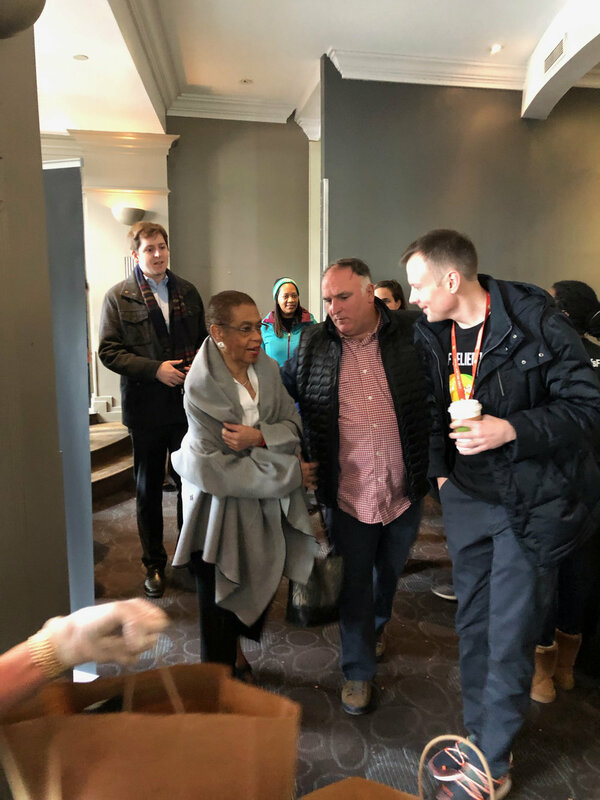 Representatives Joe Kennedy from MA and Eleanor Holmes Norton from DC visited Chef Andrés while I was there. Later, Senators Van Hollen and Cardin (Maryland!) went. Nancy Pelosi helped the day before. Yesterday, the café served 11,400 meals. Today, the Republicans voted to keep the government shut down. Please watch this powerful, fact-based, historically-accurate and provable rebuttal by Colorado Senator Michael Bennet. The book we chose for the Open Discussion Project’s next discussion is How Democracies Die by Daniel Ziblatt and Steven Levitsky. It’s eerie, really. I am well-informed but maybe I wish I weren’t. Part of me wishes I didn’t see so clearly how trump’s behavior tracks almost exactly with the four warning signs Ziblatt and Levitsky lay out in a nation’s descent from democracy to authoritarianism. (If you want to watch the authors present the Cliff’s Notes of the book, click here.) And in votes like today’s, I see people enabling the fall. For NOTHING but fear and/or ephemeral popularity or relevance. For what it’s worth, I’ve not met one trump supporter volunteering to help furloughed workers.